The allowances sold at the auction are for compliance with the state’s greenhouse gas reduction law, the 2006 Global Warming Solutions Act, known as AB 32. Compliance with the program begins January 1, 2013 and includes nearly 600 industrial facilities and utilities. The November 14 auction took place during a three-hour bidding window during which a total of 61.2 million carbon allowances were offered for sale. Winners will be announced on November 19 online, click herefor results. On Tuesday, the California Chamber of Commerce filed a lawsuit in Sacramento Superior Court seeking to invalidate the auction. The action by the Chamber, a long time opponent of AB 32, did not delay or halt the event. The Chamber objects to the fact that the Air Resources Board holds allowance auctions and reserve sales that permit market participants to acquire allowances directly from the Board. The complaint asserts that the Board is not authorized to impose fees other than those needed to cover ordinary administrative costs of implementing a state emissions regulatory program. 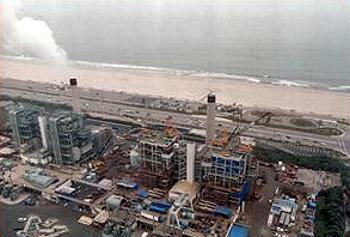 “What was not authorized by AB 32 is the Board’s decision to withhold for itself a percentage of the annual statewide greenhouse gas emissions allowances and to auction them off to the highest bidders, thus raising from taxpayers up to $70 billion or more of revenue for the state to use,” according to the complaint. At the same time, a new public opinion poll of voters in California, Oregon and Washington released today shows strong support for accounting for the costs of greenhouse gas emissions and investing in clean energy sources. The poll, conducted October 29 through November 1 by Lake Research Partners, was sponsored by BlueGreen Alliance, Ceres, the Natural Resources Defense Council and the U.S. Green Building Council. Respondents supported proposals to create jobs by investing in making homes and businesses more energy efficient and expanding investment in clean fuels, electric vehicles, bus rapid transit and commuter rail. Pollsters found strong support for closing tax loopholes for fossil fuels and training workers to transition from polluting industries to clean energy industries. Support for investing funds raised from pollution fees in expanding clean energy sources was approved by a greater number of respondents than a proposal to invest those funds in deficit reduction. “Infrastructure investments will create jobs here at home and ensure that future generations are better prepared,” she said. Ceres manages the Investor Network on Climate Risk, a network of 100 institutional investors with about $10 trillion in assets under management. “The implementation of AB32’s cap-and-trade system is a huge leap forward as California continues its journey to lead America – and the world – in developing a cleaner energy future,” said David Foster, executive director of the BlueGreen Alliance, a national partnership of labor unions and environmental organizations with more than 15 million members. For the past three years, some 625 facilities in California with emissions exceeding 25,000 tons of greenhouse gas emissions a year have been reporting their annual emissions to the Air Resources Board. The results are independently verified by greenhouse gas emissions verifiers, trained and accredited by ARB. California’s is the only system in the nation to require third-party verification of greenhouse gas reporting. This accurate and verified mandatory emissions reporting is the foundation of California’s cap-and-trade greenhouse gas emissions reduction program. The total number of tons of greenhouse gas emissions each company reports is equivalent to the number of permits, known as allowances, it must provide to ARB. In the beginning of the program, starting in 2013, the majority of those allowances are provided by ARB free of charge. The remainder needed to cover a company’s annual emissions can be bought at an auction held four times each year by ARB, or on the open market where companies that have made reductions offer surplus allowances for sale. Over time, the total number of allowances ARB issues drops about two or three percent from one year to the next. This effectively limits and then lowers year over year the amount of greenhouse gases that all the major sources in the state can emit. Accurate and verified reporting demonstrates precisely how companies statewide are meeting the lowered cap on emissions. On the Air Resources Board website, visitors can now locate the major sources of greenhouse gases and easily examine the emissions of each facility with a new mapping tool.